High blood sugar developing during pregnancy is called gestational diabetes. Since this type of diabetes may go undetected because of the lack of obvious symptoms, it is typically found during a screening performed between the 24th and 30th weeks of pregnancy. If gestational diabetes is diagnosed, a diabetes pregnancy diet is in order. A good, balanced diabetes pregnancy diet is important to maintaining the mother's health and helping to insure a complication free pregnancy. This diet by itself is usually enough to control blood sugar, but sometimes insulin injection becomes necessary. Being mindful of the total daily calorie intake, avoiding foods that increase blood sugar, and eating more of the foods which aid in the maintenance of normal blood sugar levels are the backbone of a good diabetes pregnancy diet. The carbohydrates in the food you eat become glucose in your body. Glucose is a major source of energy. Carbohydrates come from starchy foods such as pasta, bread, potatoes, rice, and other grains. They are also found in fruit, dairy foods, vegetables, and sugar. Eating the right balance of carbohydrates, fat and protein is an essential part of the diet. Women who are pregnant should get about 45 to 60 percent of their calories from carbohydrates, 15 to 25 percent from protein, and 20 to 30 percent from fat. They also require about 300 extra calories daily in the second and third trimesters to ensure proper weight gain. An additional 10 to 12 grams of protein per day is also required to help the baby grow normally. 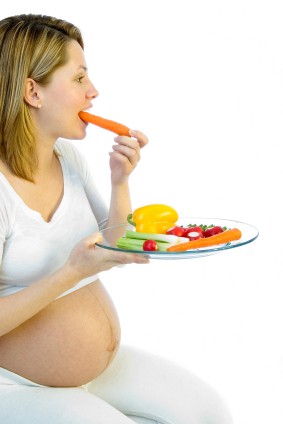 A registered dietitian is essential to helping you plan your diabetes pregnancy diet. Your doctor can help you locate one and the American Diabetes Association can also assist you in finding one. Coping with pregnancy is burden enough, but finding out that you have gestational diabetes adds an extra load. But it's important to remember that this form of diabetes usually goes away after the baby is born and the baby is typically not affected by the disease. Just focus on maintaining a healthy blood sugar level, sticking to your diet and following doctor's orders. The control of blood sugar cannot be overstressed and the diet is the single most important factor in controlling diabetes while pregnant. With the right diabetes pregnancy diet and a good team of diabetes professionals to assist you in avoiding complications, the disease should not harm the mother or child.